You’ve seen most of this stuff before so feel free to skip on but I really couldn’t pass up the opportunity for some self congratulatory back patting. (I could pretend that it’s just to make Azazel’s life easier when he comes to writing his community challenge round up but really it’s all about the backpatting!) Most hobbyists will be aware of Azazel’s Bitz Box and the monthly challenges he’s been running throughout 2018 (and if you’re not, make yourself aware and in short order!). October’s challenge called for the completion of a squad or squads, whether that be building and painting them from scratch or adding the last few layers to the final model that you’ve just never found the time for. As it turns out I managed to complete quite a few. Let’s take a look at them all. In the grim darkness of the far future humanity won’t be left entirely undefended as my space marine squad grew to ten men. When I posted the squad’s sergeant last week Alex, of Leadballoony fame, suggested that I’d forgotten to drill out the barrel, although in fact I thought I’d forgotten to paint in the lens. This led to an interesting discussion on how plasma weaponry actually works in the 41st Millennium. In the end I’m holding to my theory that the gun ends in a lens but, in the interest of keeping it from getting cracked and chipped, it should be recessed a little way inside the barrel. Lest this new strength on the part of the Imperium go to humanity’s collective heads I recruited a few more Ork Nobs as well. As I’ve yet to see the Ork codex (which is fair enough, it’s not even officially released until tomorrow) I don’t know if this is still a full unit or not (it was in Index Xenos) but I’m going to count it for this month anyway. More Nobs will be forthcoming from me at some point, but for now I’m calling this squad done. …whilst the Squigs may not be a full “official” unit (8th Edition Warhammer rules called for at least ten) I’ve painted all the models I own so I’ll be calling it at that for now as well. The underground arms race between the goblins and the Skaven means it was vital that the ratmen brought in reinforcements to deal with all these extra greenies, so I also completed my squad of rat ogres. When I posted him the other day I forgot to include a group shot of the squad but not to worry, here’s one now! Add in the various other things I’ve painted this month and it comes to a not insignificant 69 models. Suffice to say I’m rather proud of this progress but fear not, I won’t be resting on my laurels, there’s plenty more to come. Next on the list will be building my House Cawdor Stig-Shambler for Necromunda. The half of him that hits things still needs a little more work before he’s ready to show off but the half that does the thinking has been ready for action for a while, so here’s a little sneak peak of the brains behind the operation. You’ll have to wait a few more days before the rest of him is finished but, all being well, I’ll crack on with him over the weekend. Watch this space! It amuses me that the last time I showed one of these assault marines I received three key pieces of advice. 1. The jump-pack is too small. 2.The jump-pack is too big. 3. The jump-pack is just right. Faced with such a united front from my readership what choice did I have but to forge onwards and build another one? Starting work on a little foray into throne-loyal power-armour. 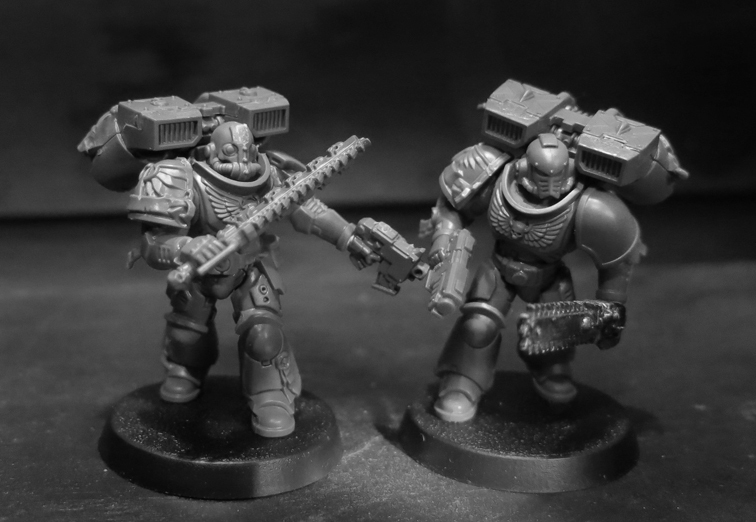 Although historically my preference for astartes has always leaned heavily towards the servants of chaos the chance to start a small collection of truescale marines was too good to pass up. Probably won’t do much more for a little while as so many other projects are jostling for attention but wanted to do a little kitbashing to test the waters, starting with this assault marine. As ever feedback is more than welcome.